The unalloyed titanium refers to commercially pure titanium which has minimum titanium contents ranging from about 98.5 to 99.5 wt%. They are primarily used for corrosion-resistance applications as well as applications requiring high ductility for fabrication but relatively low strength in service. Generally, there are four grades of unalloyed titanium available: ASTM Grade 1, Grade 2, Grade 3 and Grade 4. The UNS designations are presented respectively: titanium grade 1 – UNS R50250, titanium grade 2 – UNS R50400, titanium grade 3 – UNS R50500, titanium grade 4 – UNS R50700. 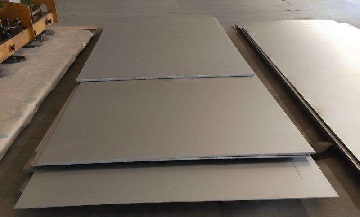 ASTM B265 grade 2 titanium plates. *All contents are in wt% unit; Each: other elements, each; Total: other elements, total. *The values are minimum unless a range is specified. The titanium is a highly reactive metal that will instantly react with oxygen in atmosphere. However, the tenacious stable oxide film formed prevents the oxidation from going on. This is the mechanism of excellent corrosion resistance of titanium surfaces which are exposed to air or moisture. Appreciable corrosion may occur under anhydrous conditions in absence of oxygen since the protective film may not be regenerated if damaged. This is why crevice corrosion of unalloyed titanium occurs. 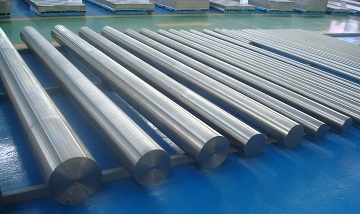 Grade 3 titanium round bars manufactured to ASTM B348. All grades of unalloyed titanium have the α phase metallographic structure which is hexagonal close-packed (HCP). The alpha phase transforms to a body-centered cubic (BCC) crystal structure (β phase) at 883°C [1621°F]. The unalloyed titanium has differentiated small traces of interstitial elements including carbon, nitrogen, iron, hydrogen and oxygen. By varying these interstitial elements, the strength of the material can be increased. The unalloyed titanium can be furnished in various product forms such as billets, bars, plates, sheets, wires, pipes, tubes, fittings, flanges, castings, bolts and nuts, etc.